An ornate golden crown that will go onto the coffin of Richard III when he is re-buried is being displayed at Tewkesbury Abbey. 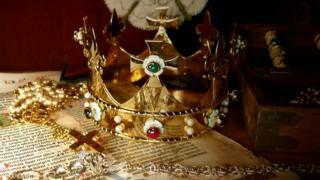 The crown was commissioned and paid for by the historian Dr John Ashdown-Hill who helped identify the king's remains. Amanda Thomas from Tewkesbury Abbey said: "It's gold with sapphires, diamonds, garnets, studded with jewels, a lovely piece." Dr Ashdown-Hill will also be giving a talk about his work at the Abbey later. The remains of the king were found buried in a Leicester car park, with DNA tests used to confirm the identity. Who, What, Why: What is the method for reconstructing Richard III's face?